Big trucks are big business, advertises WasteExpo 2019. Indeed, nearly 14,000 waste and recycling industry participants will gather for the exposition at the Las Vegas Convention Center. There, you’ll find over 600 exhibitors — including, of course, Ampliroll. By attending the show, you can check out first-hand the many advantages and latest advancements of Ampliroll Hydraulic Hooklift Systems, Ampliroll Truck Bodies and related equipment. Save big by buying a single cab and chassis. By equipping it with an Ampliroll Hooklift System, you’ll gain as much as 100% utilization from it. You’ll also license one truck, insure a single vehicle, and hire one driver. If you’re a waste or recycling fleet operator, your savings are multiplied with Ampliroll! Load a single chassis with as many different bodies as you need with an Ampliroll Hook Loader. In the waste industry, you’ll likely drop off empty containers at various sites, pick up full ones, and repeat the process again and again. Load and unload more refuse or scrap containers per shift with Ampliroll roll-on rigs when compared to cable loaders. Ampliroll Hydraulic Hooklift drivers don’t even have to leave the cab! Reduce the risk of operator injury. Cable loader operators sometimes have to cover slippery ground when hooking up cables. They also stand outdoors next to moving machinery when operating controls. With cab-mounted controls, Ampliroll Hooklift System drivers can do it all without stepping outside. Choose from a wide line of Ampliroll Truck Bodies. These include roll-on containers of all sizes for waste and recycling. The selection extends to chippers, water tankers, septic pumpers, aerial lifts to 48’ working height, cranes and more. It’s an Ampliroll exclusive! No other hook loader competitor matches this capability. 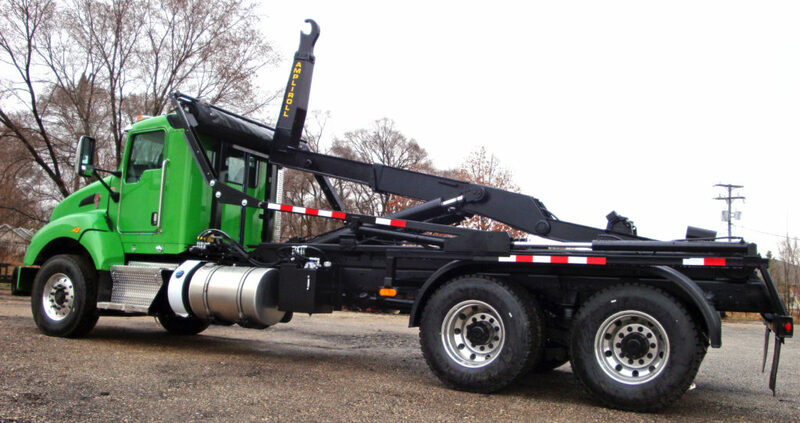 Simplify purchasing and after-sales service when you specify Ampliroll Hooklifts and Ampliroll Truck Bodies as an all-in-one “package.” You can even obtain financing at competitive rates through Ampliroll! Be sure to visit us at Booth #1985 at WasteExpo in Las Vegas on May 7-9, 2019. Click on VIP Ticket – Waste Expo 2019 to get your Free Pass courtesy of Ampliroll.